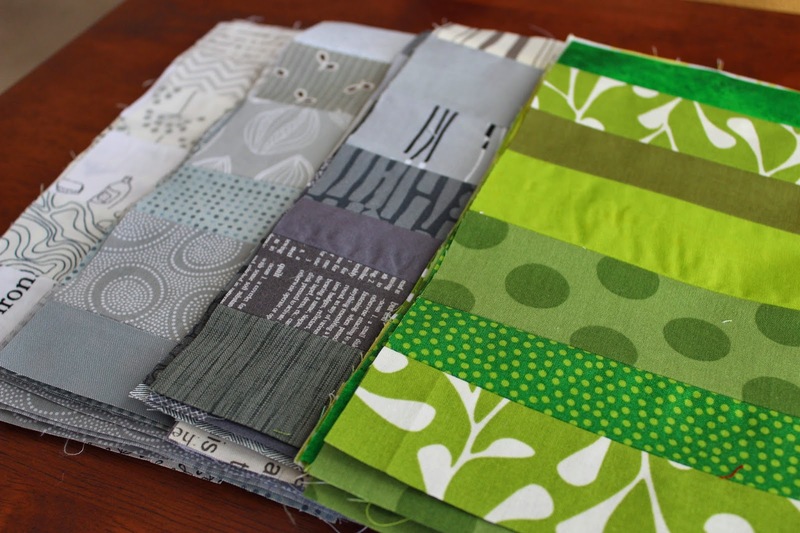 This simple baby quilt was a response to my son's request for a gift for his teacher's baby. She had her first child today, a little girl. I chose a clean, modern design that has been in a my sketchbook for a while. It was quick to make (which was necessary since he asked me to make it just a week before her last day! 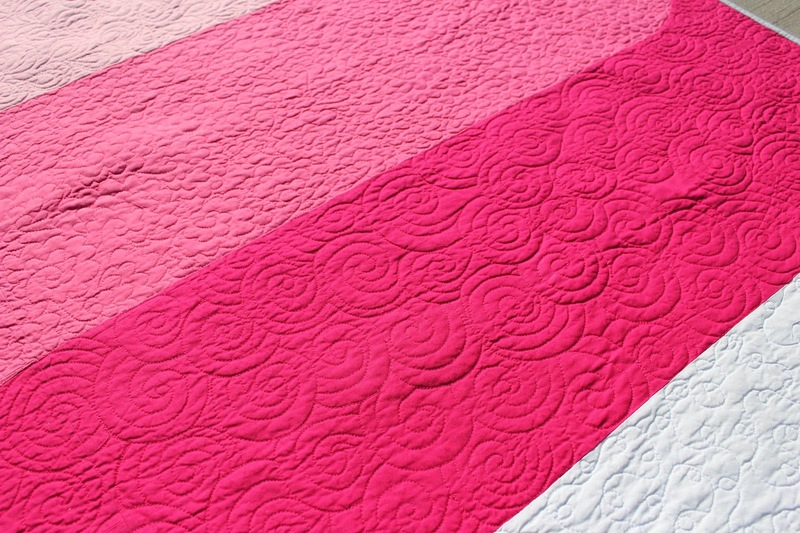 ), and the solids I picked create a great space to showcase free motion quilting designs. 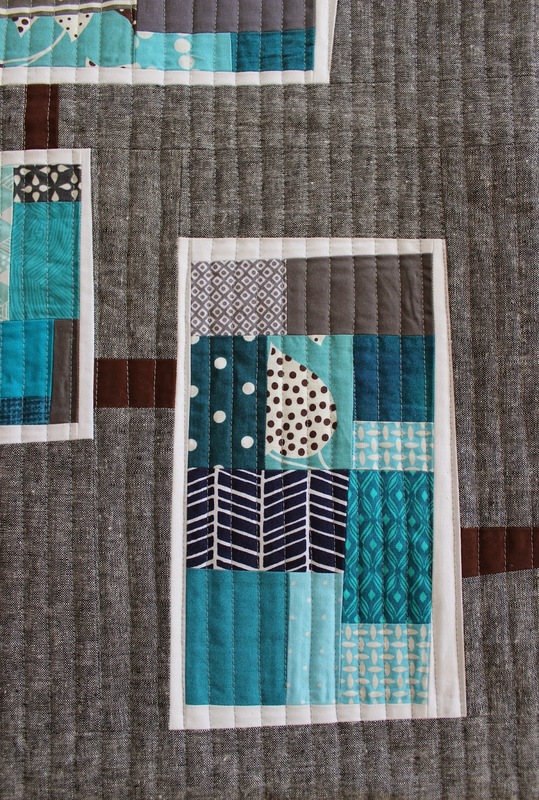 I quilted a different design in each color with matching thread. 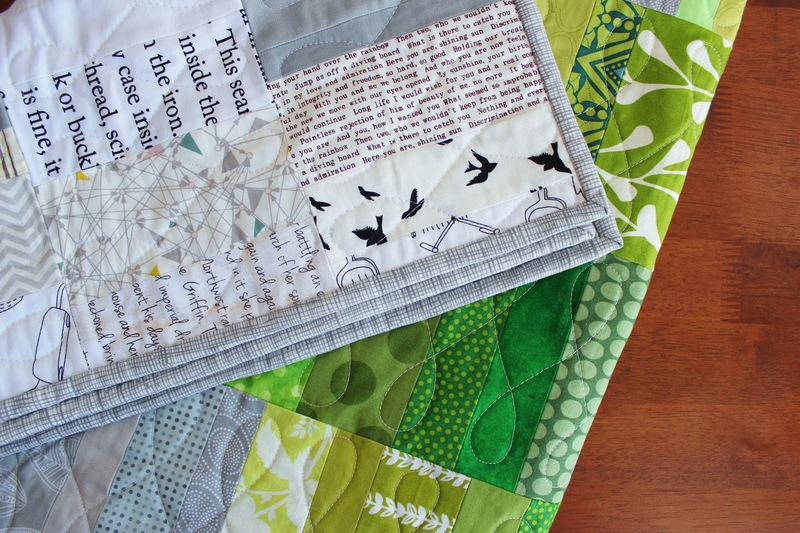 Each of these designs can be found in Angela Walter's book Free-Motion Quilting. 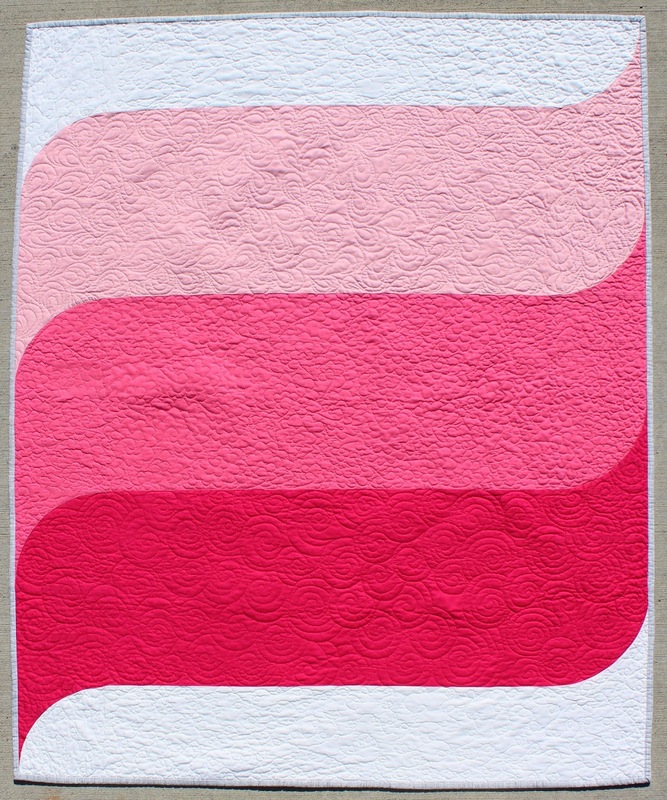 I picked three shades of pink from my stash, white, and grey sketch binding. I hope it is used and loved for years. It was a pleasure to make for someone who has put so much time and care into teaching my child. 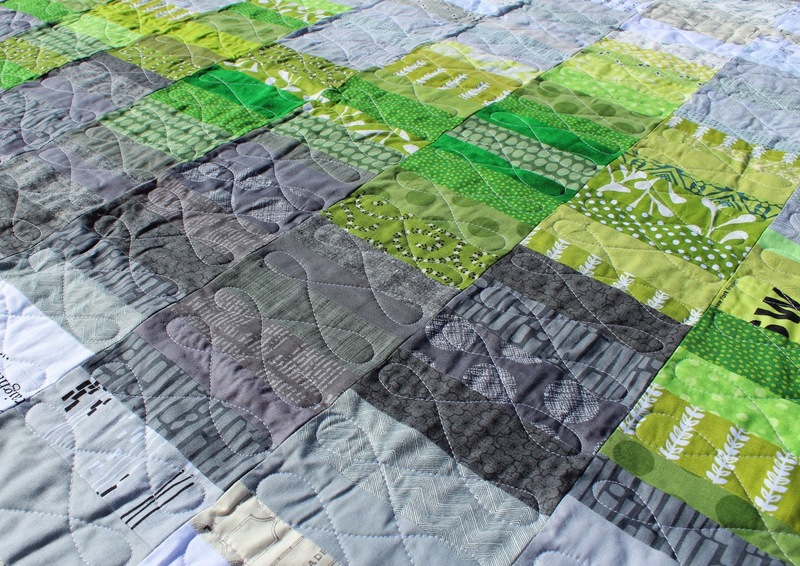 I have plans to make a couple of these 40 x 50 quilts in other colors for my etsy shop, but you know what they say about plans. 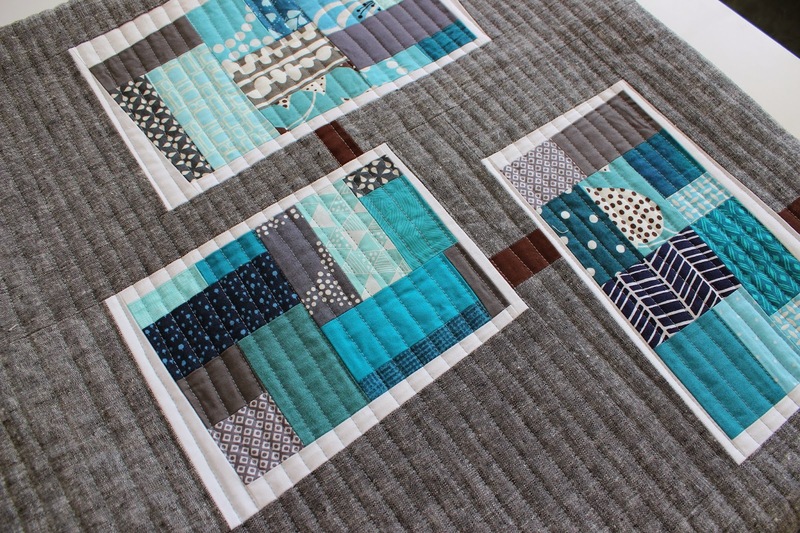 Want to make your own Waves Baby Quilt? 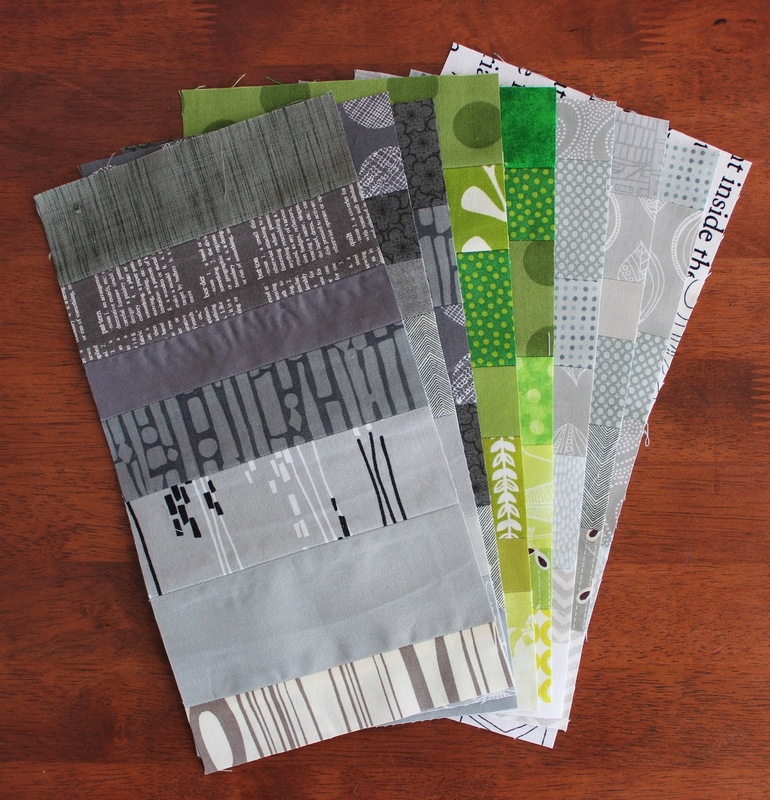 The pattern is now available as an instant download PDF. 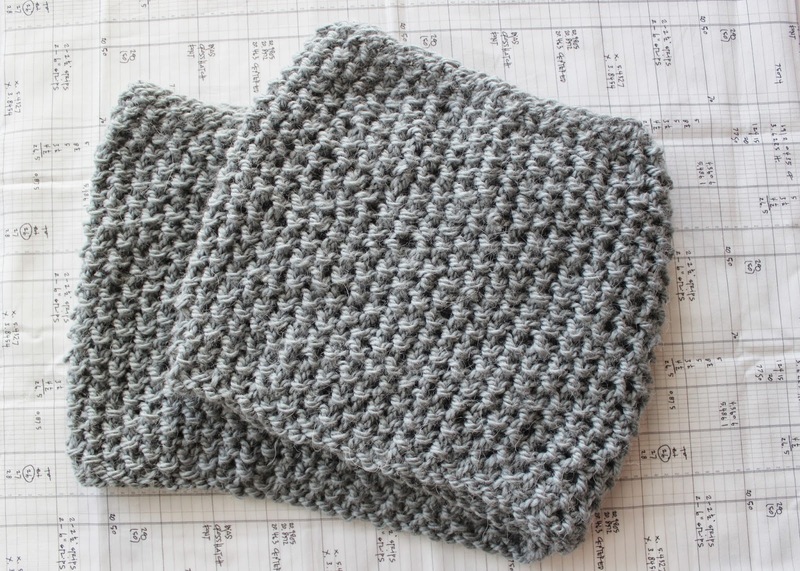 In keeping with my tradition of knitting one item a year, I finished a cowl for myself. I'm super excited to be able to wear it before spring arrives. 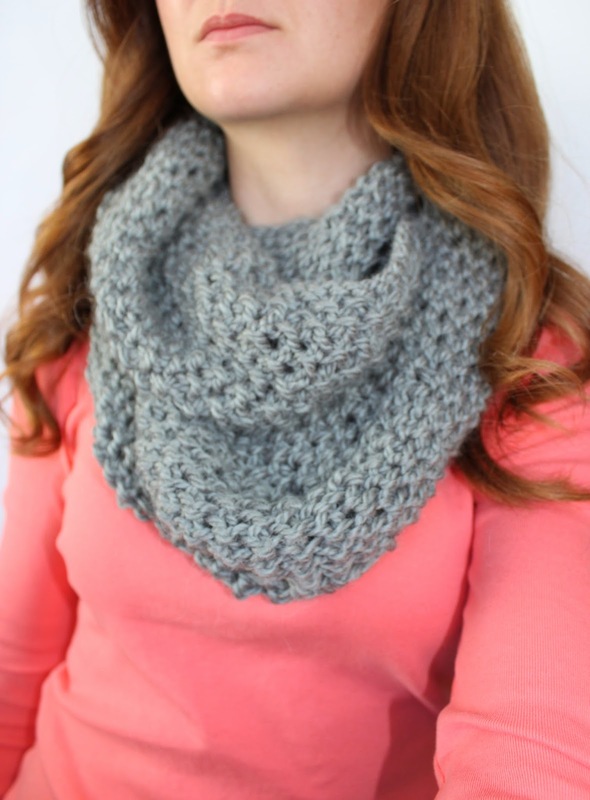 The pattern I used is called the Gap-tastic cowl, which is available as a free download on Ravelry. 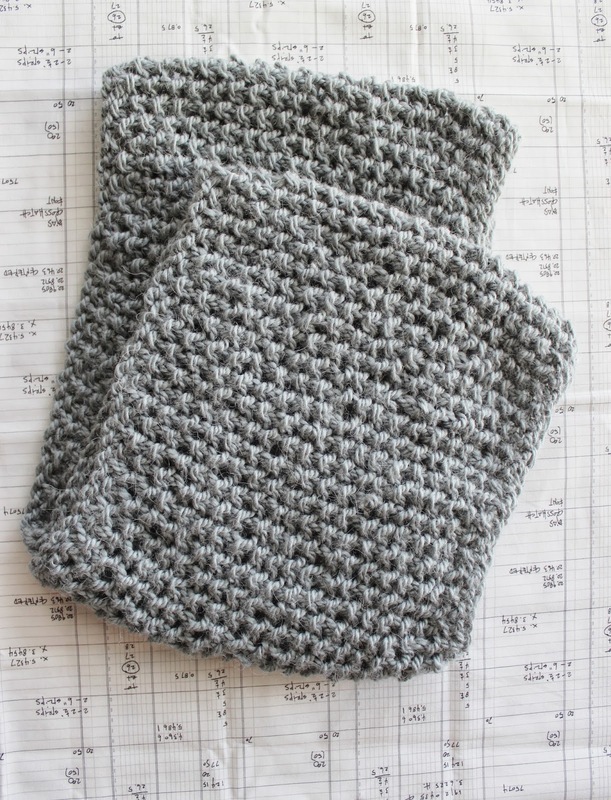 It is a perfect pattern for beginners, or those who are only capable of mindless knitting like myself (I don't know how knitters keep stitch patterns in their minds, let alone read or talk while they create intricate designs). This is a simple seed stitch done on big, circular needles with bulky weight yarn. Trust me: if I can knit it, you can too. 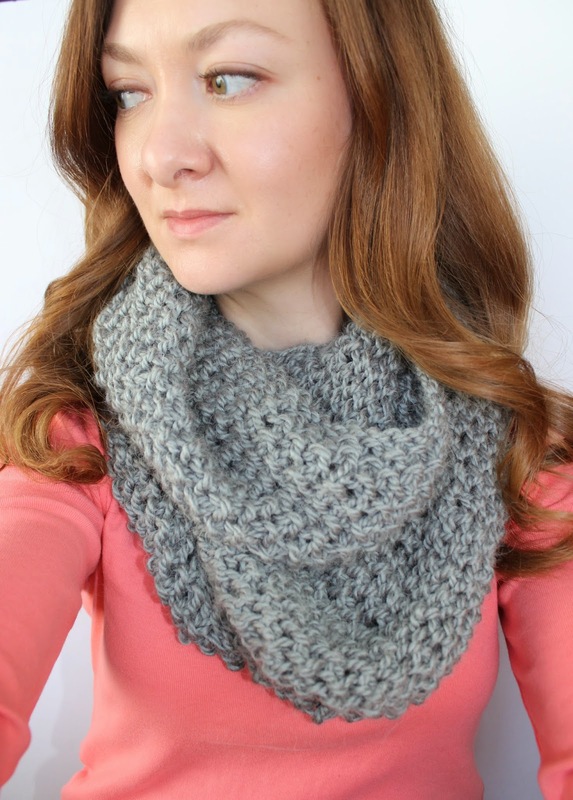 The yarn is an acrylic, alpaca blend by Bernat in Soft Grey. It ended up a little fuzzier than I wanted. I will definitely be making this pattern again, so I will look for a yarn with better stitch definition next time. I'm open to suggestions from you more experienced knitters. 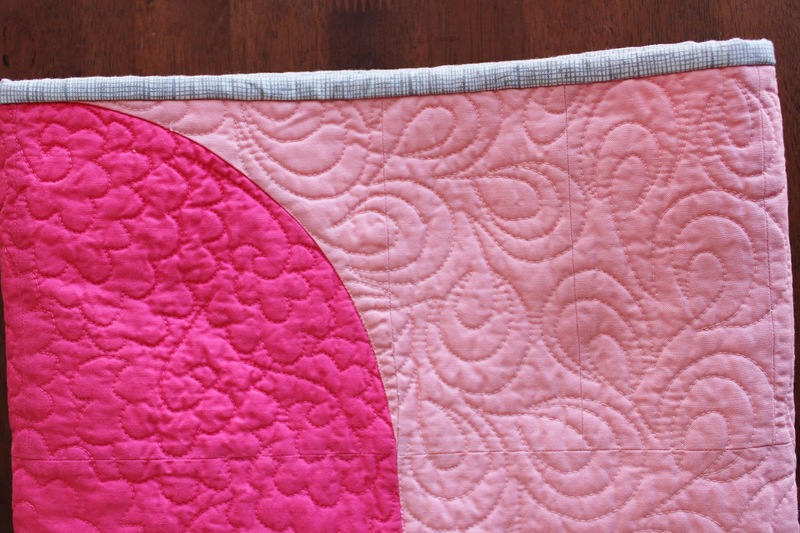 The starting point for this extra large quilted pillow (24 x 24) was the tiniest of scraps. 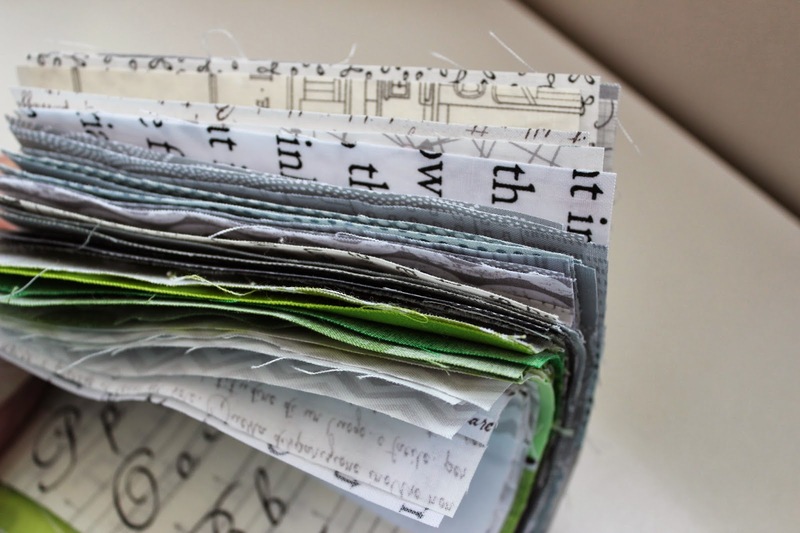 I picked the smallest blue and gray scraps from my tickertape pile and sewed them together at random to make what I call strata. 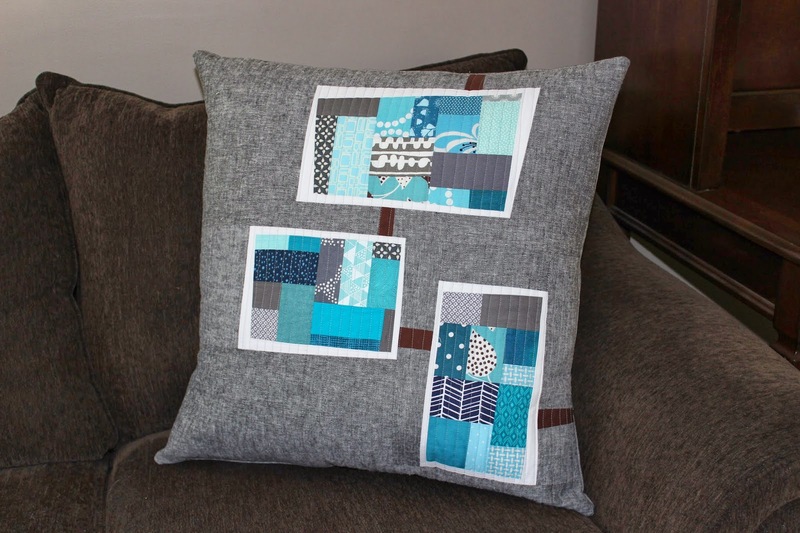 You can find a similar technique in Quilting Modern by Jacquie Gering and Katie Pederson where it is called crazy piecing. You can click the photo below to find an affiliate link to the book. 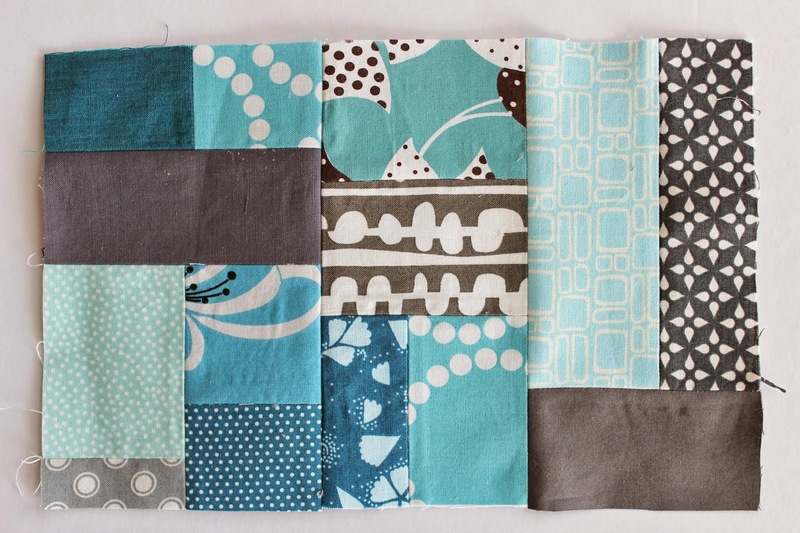 I trimmed the strata which, once made, can be used like any other piece of fabric, into squares and rectangles. I trimmed each shape a bit wonky, adding white around the edges to frame it against the black, Essex yarn dyed linen. A line of brown ties the blocks together. Working completely improvisationally, like this, is a bit of a puzzle. Figuring out how to fit the components together forces me to think critically and reevaluate constantly. In the end, I love my improv pieces for it. They are unique, even when inspired by quilts or techniques in a book, as mine was. 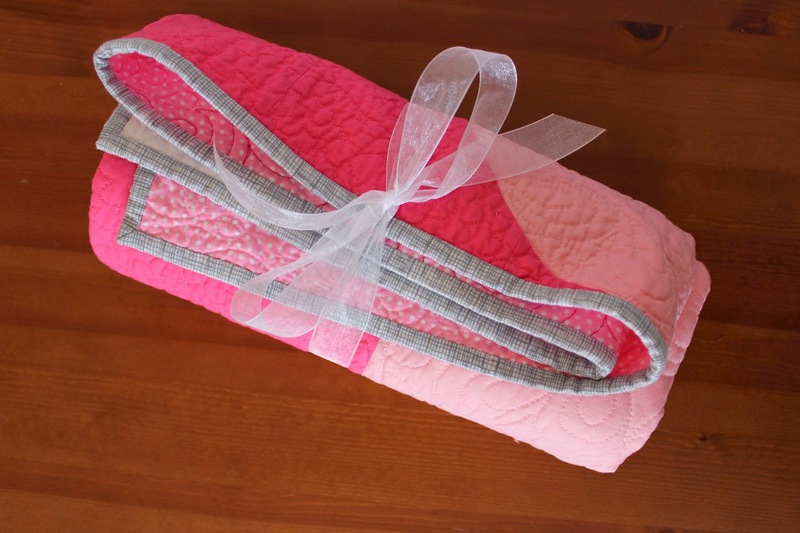 The pillow top is quilted with organic straight lines, and the back is a self-lined envelope closure (great tutorial by Amanda Jean here). 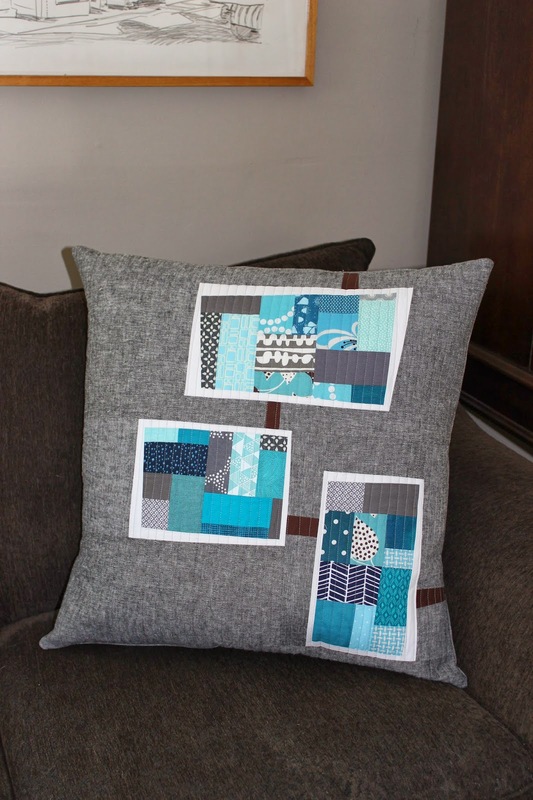 You can find this one-of-a-kind pillow cover in my etsy shop. 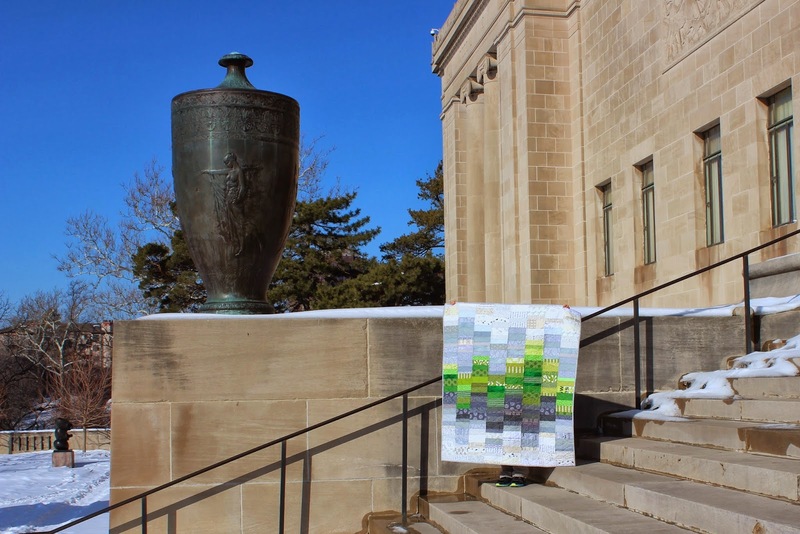 The colors in this improv, strip set quilt remind me very much of Scotland: its gray skies, stone building, streets, and fog, set against the lush green of manicured gardens, sweeping fields, and mountains. The gray contrasts so nicely with the green, making it seem even more saturated. It makes me think of the way the color of the grass looks through the rain. 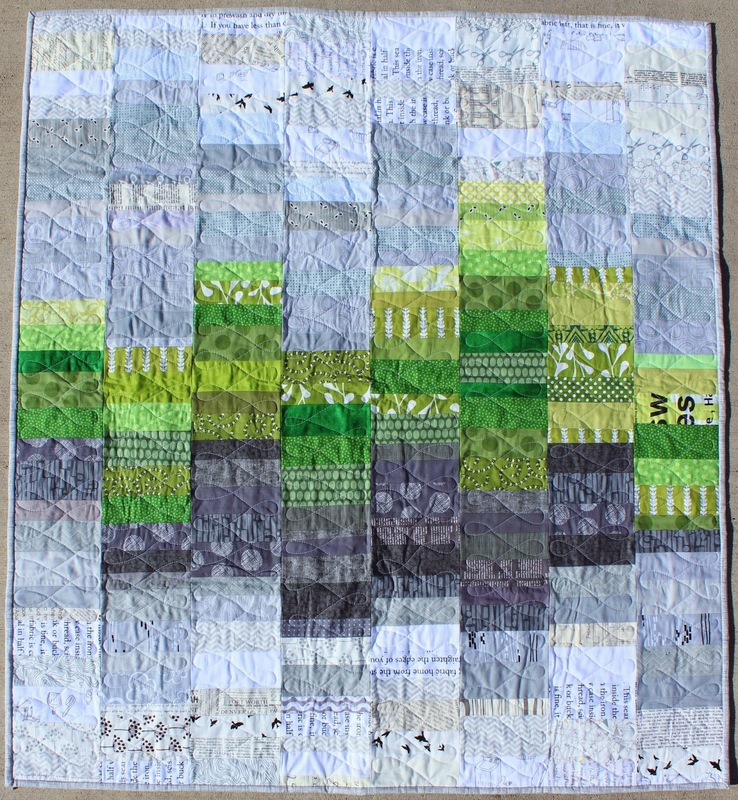 I made the quilt using the same improv technique as The Therapist and Partly Cloudy. 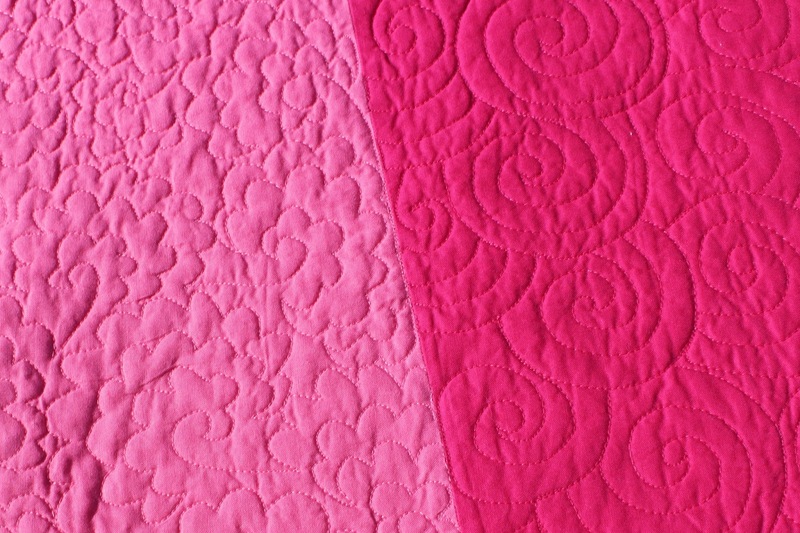 I quilted it using the same, simple figure eight free motion design. 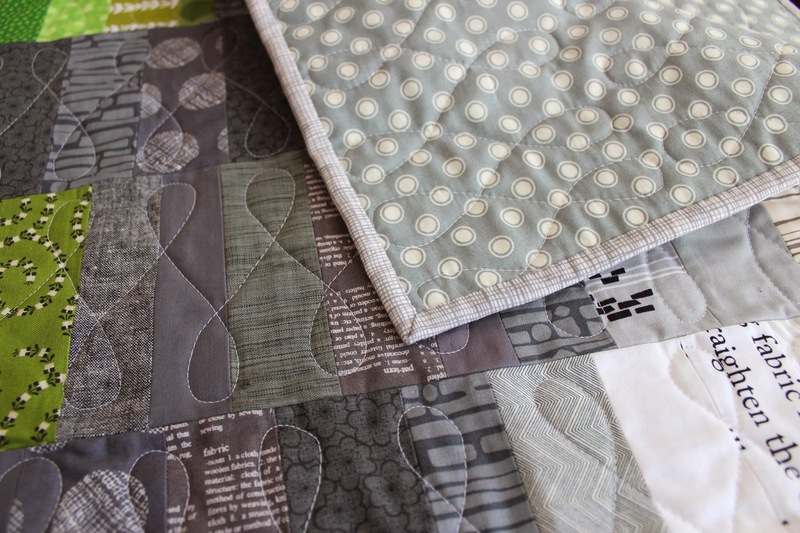 The binding is such a versatile print: Heath in gray. The backing is a DS Quilts polka dot. 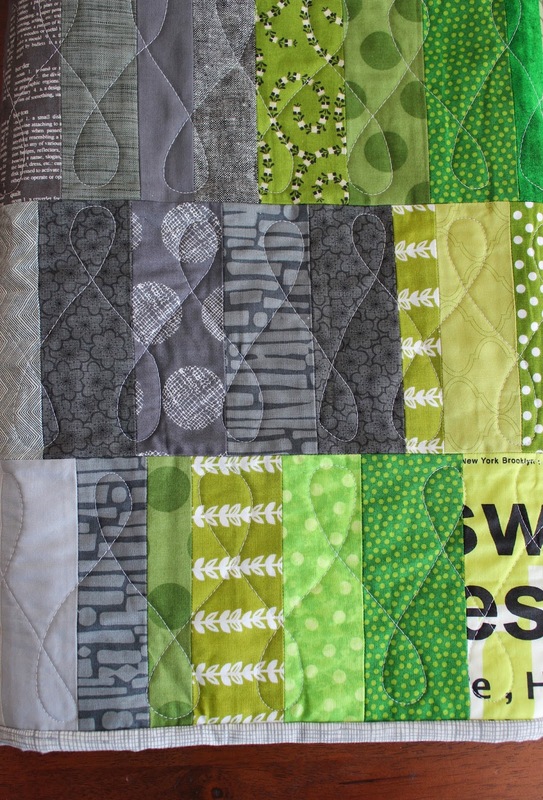 This 40 x 45 baby quilt is available in my etsy shop. Wow, it is cold outside. 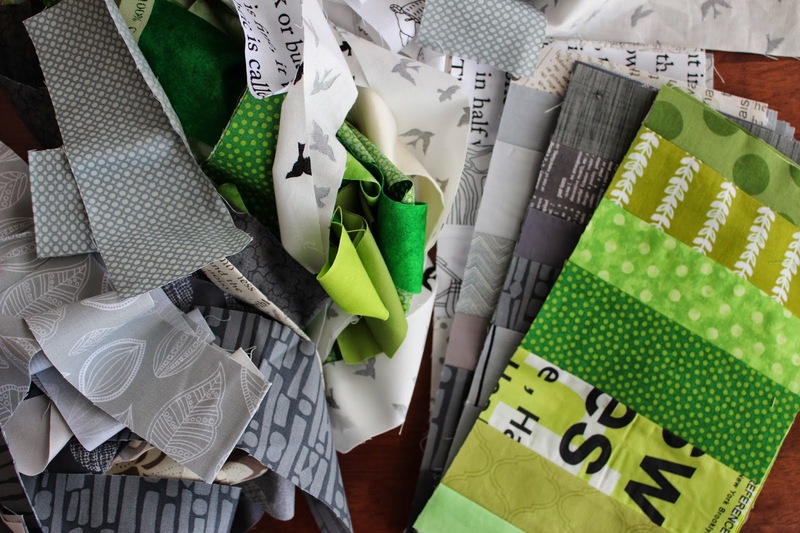 I'm distracting myself from the subzero temps forecast for us overnight and a third snow day in a row tomorrow by playing with my scrap strips. I was inspired by the colors in this photo. 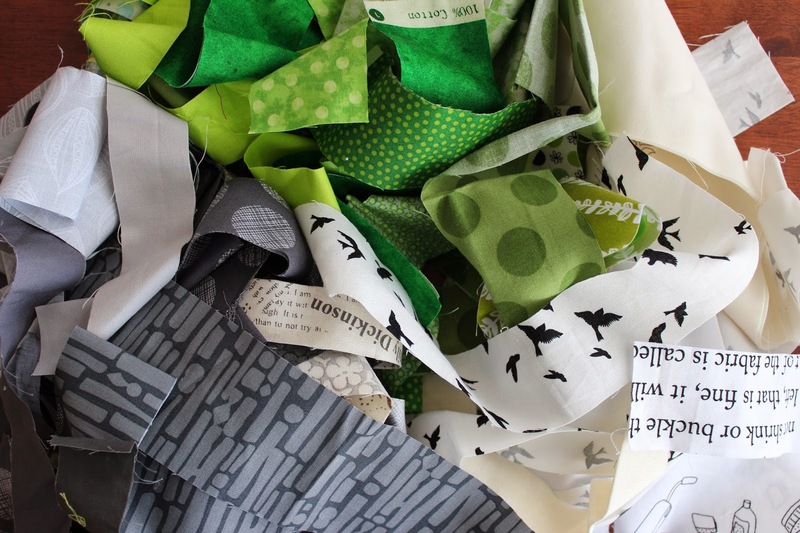 It made me remember why green is my favorite color and wonder why I don't sew with it more! 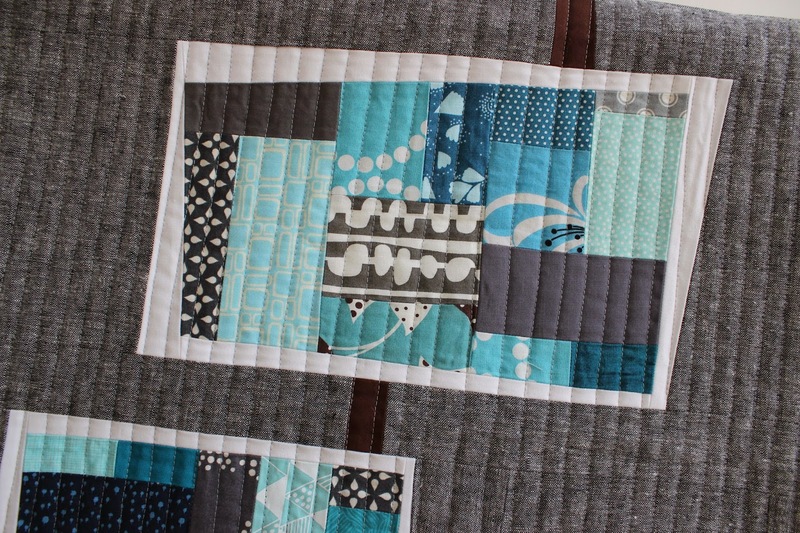 I'm creating simple 5 x 10 finished blocks from improv strip sets, just like the ones I made for The Therapist. 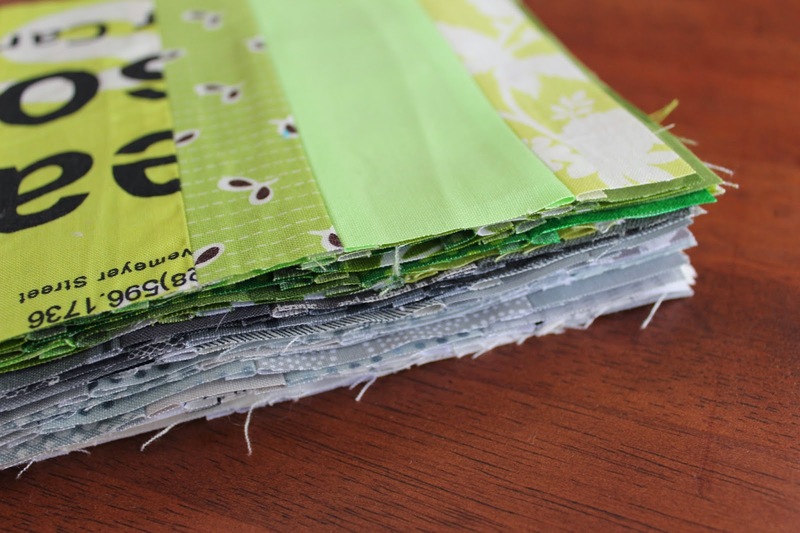 They couldn't be easier to sew, and they use up all those skinny leftover strips. 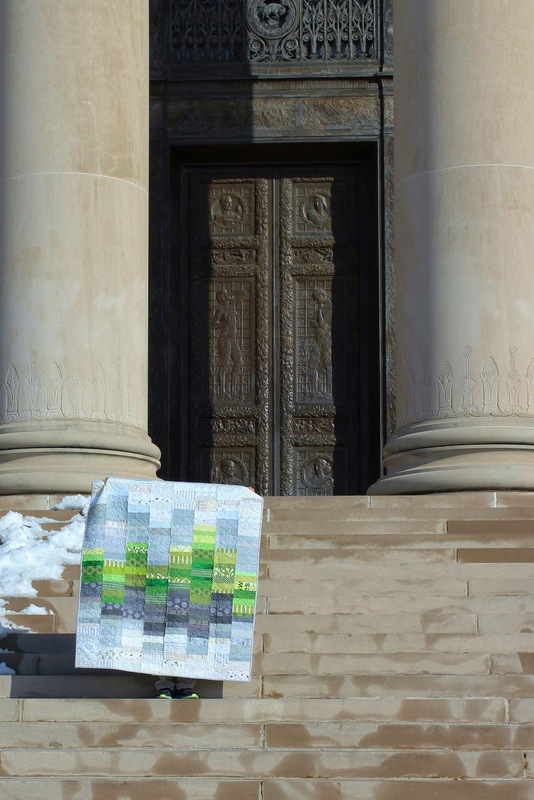 I plan on making 40 blocks for a 40 x 50 baby quilt, very similar to Partly Cloudy. 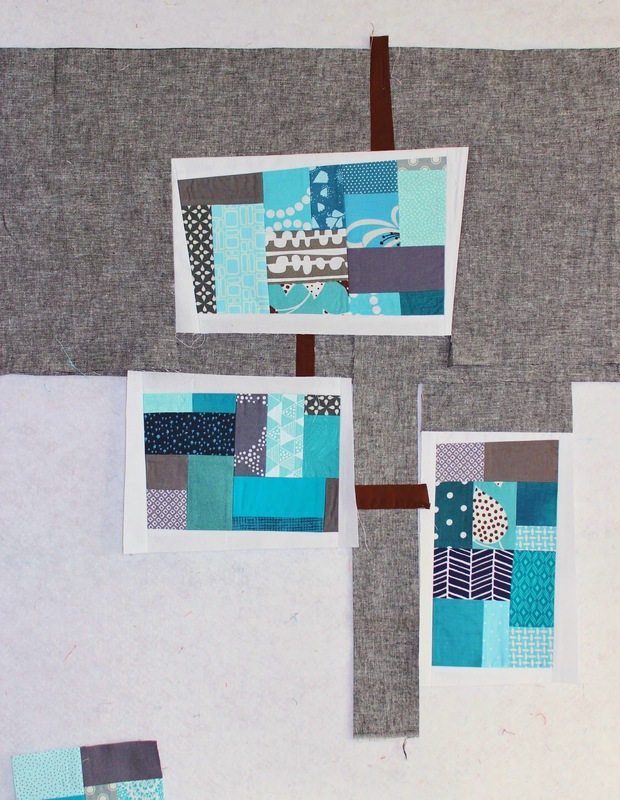 I have just a few more blocks to make, and then I will play with the layout.